Painting a group painting at the easel with acrylics. Designing a "Worm House" in a sketchbook. 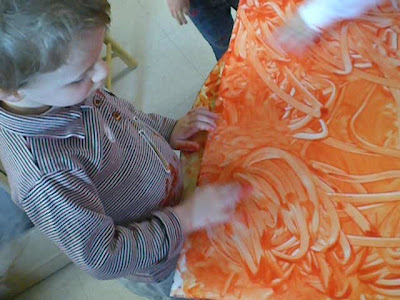 Finger painting in the YD classroom. school . I've already had people wanting to buy it! Beautiful posture while drawing the worm house. working on a detailed drawing in their sketchbooks. "Double dipping" is okay in the paint jar. "My worm house has wings. It is flying!" The threes paint with vigor. YD painted with red and yellow finding out that it makes yellow. drawn from life and memory. "This is for my Mom" I hear this quite often. gets them to stand using their creative self and muscles. These are more drawings from the Pre-K.